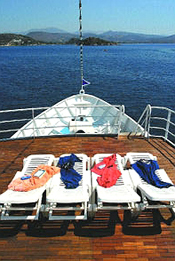 Sea Cruises Exclusive was established in 1991, being the owning and / or operating company of middle size luxury cruising vessels, all being engaged in the one day cruise business. Our activity has expanded in various areas all over Greece, including the Cyclades islands, Crete, Kalamata and Zakynthos. Since 1996 our activity moved to Athens area, offering day or night cruises to the neighboring islands always on an exclusive charter basis. S.C.E. is currently the exclusive operator of the cruising vessels ''Alkyonis” and ''Mantalena” and the only company in Greece specialized in upgraded, custom - made day or night cruises, mainly addressed to the corporate, incentive & congress market. We organize day and night cruises in the Athens area, always on an exclusive charter basis, with voyage schedules and services customized for each event. 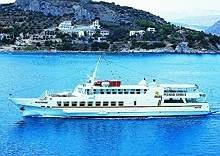 A day cruise could include the most popular destinations near Athens such as Aegina, Poros or Hydra, as well as more isolated or remote destinations including the Corinth canal, Epidavros, Cape Sounio, Agistri, Spetses and other sites of interest. 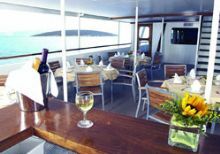 A night cruise usually combines dinner and entertainment on board with slow navigation along the coastline of Attica or a short visit of a close island. 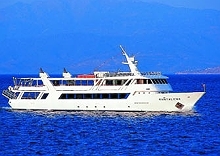 Exclusive operators in the Athens area of the day cruising vessels ''Alkyonis” and ''Mantalena”, two of the most modern, comfortable, safe and luxurious vessels of this category in Greece. The ''Alkyonis” is a fast and handy vessel, ideal for day excursions, whereas the ''Mantalena” has plenty of open deck areas, thus being ideal for day excursions of larger groups as well as night events. b) Entertainment on board, by selecting among live music or DJ sets, dancing shows, karaoke, fireworks shows, team games etc. e) Additional services, such as transportation to the vessel, hotel arrangements in case of overnight ashore or dining on a destination island. 80 % of our customers are well-established Greek and foreign corporations, who enjoy a friendly and luxurious environment and integrated services for their events. Major companies such as Kodak, Heineken, Coca-Cola, Novartis, Levi’s, Luis Vuiton, Peugeot, Texaco, Michelin, Visa any many others are included in our customers list. Our company's long expertise is also reflected by our participation in important international events. The Athens 2004 Organizing Commitee chartered the "Mantalena" to be the only spectators' boat for the sailing events during the Athens 2004 Olympic Games. The same vessel was chartered by America's Cup Management to serve as a spectators' boat for the big sponsors' hospitality program, in the 32nd America's Cup held in Valencia in 2007.